Sometimes it’s easy to memorialize the dead. This isn’t one of those times. I appreciated how much time was put into describing the four most important characters before the mystery begins. It took me a few chapters to settle into the pacing because I was initially expecting everything to move more quickly than it did. Once I got used to the rhythm of it, though, I was really glad that I knew as much about these characters as I did. The relationships between and among them are really what drive the rest of the plot, so the payoff later on was well worth the wait. The characters in this tale speak in a thick Scottish brogue that occasionally spilled over into the descriptive passages as well. Most of the time this technique worked incredibly well at drawing me into the plot, but there were times when I had trouble figuring out what was being said. While I completely understand why the author decided to go this route, it would have been really helpful if there had been fewer run-on sentences written in this dialect. Some of these passages were packed with so many different ideas that I had to read them several times before I understood what they probably meant. With that being said, Mr. Meggy has an incredibly unique writing style. I never would have imagined that strings of curse words would blend together so seamlessly with his painstakingly detailed descriptions of the people and places who exist in this universe. Sometimes good storytelling demands a little vulgarity in order to accurately represent the mindset of the characters who live in that setting. This was my first introduction to this author’s work. Based on how deeply I enjoyed this mystery, I’m looking forward to seeing what he comes up with in the sequel to this book that is apparently on the way! 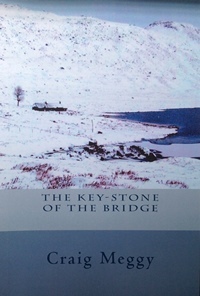 I’d recommend The Key-Stone of the Bridge to anyone who loves solving literary puzzles. This is one of the most memorable ones I’ve read in a long time.